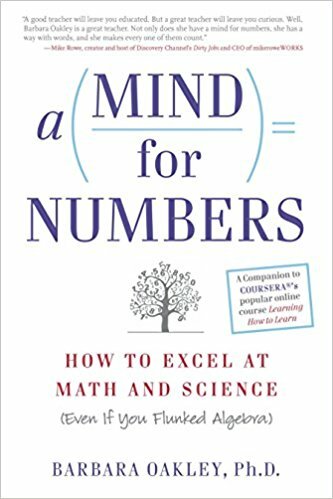 Barbara read A Mind for Numbers: How to Excel at Math and Science (Even if You Flunked Algebra) by Barbra Oakley, Ph.D. and found her study tips immediately useful. Based on extensive research, Oakley describes that the best way to learn math and science or any subject is by shifting between two types of brain activity. "Neuroscientists have been making profound advances in understanding the two different types of networks that the brain switches between—highly attentive states and more relaxed resting state networks.” Oakely calls “these two different types of networks the focused mode and diffuse mode, respectively.” Her research shows that using both in specific ways greatly enhances learning. She describes ten rules of good studying. I tried six of them. Turn off all alarms on your phone or computer and focus on your subject for 25 minutes. Then take a break, which activates your diffuse mode, and reward yourself with a walk, run, shower, crafting, looking out the window at trees or flowers, whatever is enjoyable for you. It’s a double win because you are doing something fun, and your brain will still be working on the problem in the back ground while you are not concentrating on it. I’ve been doing this for a while because my body does better if I get up and move every half hour, but now I’m more disciplined about switching between focused and diffuse mode activities. Learn small chunks of material thoroughly before you move to the next chunk. “Chunks are pieces of information that are bound together through meaning…. Once you chunk an idea or concept, you don’t need to remember all the little underlying details…It’s like getting dressed in the morning. Usually you just think one simple thought—I’ll get dressed. But it’s amazing when you realize the complex swirl of underlying activities that take place with that one simple chunk of a thought.” Thoroughly understanding an equation or a math problem or a stanza of a poem is a chunk. Many years ago I memorized some of David Whyte’s poems this way, so I know it works. Recall information. When you finish reading a chapter, make yourself think about what you remember. That causes the content stay in your brain much more than just reading the material again. Giving yourself a test is harder than rereading, but it is the most effective way to retain information. Make flash cards. Write a problem on a 3 x 5 index card with the solution on the back. “Handwriting builds stronger neural structures in memory than typing.” You can copy the card into a phone app. Study your cards off and on during the day but especially take a look before you go to sleep. Flash cards helped me throughout college and my Masters in English Literature program, therefore I’m glad to have a reason to bring them back. Use spaced repetition. Repeat chunks of information to yourself, gradually increasing the times between the repetitions. Don’t cram for a test. Richard Nadel, Senior Instructor of Mathematics, at Florida International University said, “‘When a student complains of failing and tells me he studied for ten whole hours the day before the exam, I answer, ‘That’s why you failed.’ When the student looks at me in disbelief, I say, ‘You should have been studying a little bit all along.’” We all know this is true and there are times when you’ve just not been able to get to that subject until the day before, but don’t ever expect it to work for math and science. You need short study periods over many days learning small chunks at a time. I decided to try some of her suggestions by memorizing a hymn that I like to play on the piano. I made a chunk of the first phrase of the hymn, Come Thou Font of Every Blessing, and didn’t add another chunk until I could play the first one without looking at the notes. I practiced 25 minutes and then went for a walk. I tried again that day and then left it alone until the next day. After several days of learning all the chunks, I tried remembering it in bed before I went to sleep. I learned the right-hand melody first, then added some of the left. I wrote out the lyrics. I memorized much faster than I have in the past when I just tried to play a hymn over and over. Now, one of my favorite hymns that brings me extraordinary comfort during difficult times is available to me the moment I need to hear myself play it, and that’s a very good thing. I’d love to hear if any of her steps help you to learn something new.